The 2018 Tomb Raider movie, starring Alicia Vikander, has Lara Croft sporting the climbing axe made popular by the video games. 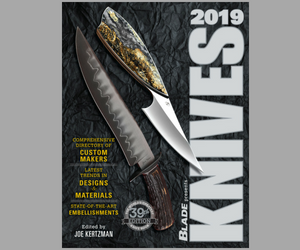 Here are eight things you may not know about "Forged in Fire," the popular knifemaking television show, as sourced from BLADE interviews with contestants. The 1999 Joan of Arc movie, "The Messenger," failed to represent the swords of the 15th century correctly on screen. A better movie got it right in 1948. It took a lot of work and research to create the Bowie knife used for the classic 1952 film, "The Iron Mistress." But when it was over, an icon would be born. Take a look at the swords featured in the epic fantasy movie, "The Lord of the Rings: The Fellowship of the Rings." Johnny Strong doesn't only use knives for scenes in his action movies. He also makes them, with a little help from Wally Hayes. Survival knives in movies don't have to be big, flashy pieces. The subtle lockback hunting knife in "The Edge," made by Brian Lyttle, proves function can trump form even in Hollywood.